Apparently Skipper didn't hear the news. I had pronounced him no longer a boat cat after our last two attempts to take him onto the boat. Or, maybe he did hear it, and that's why he had to prove me wrong. That would also indicate he really is just like one of my children, as my youngest son likes to say - even if it isn't said as a compliment. This miraculous change of heart occurred last week when we decided to stay on the boat, mostly by necessity, since we had someone renting our house, and we needed to be in Rockport for a few different events. We had been staying on the boat less and less this past year, first because we had bought a house, and then after the hurricane, because repairs to the house required our attention. So I suppose it's possible Skipper had forgotten that he used to love living on the boat with us. You never know how that walk is going to go. 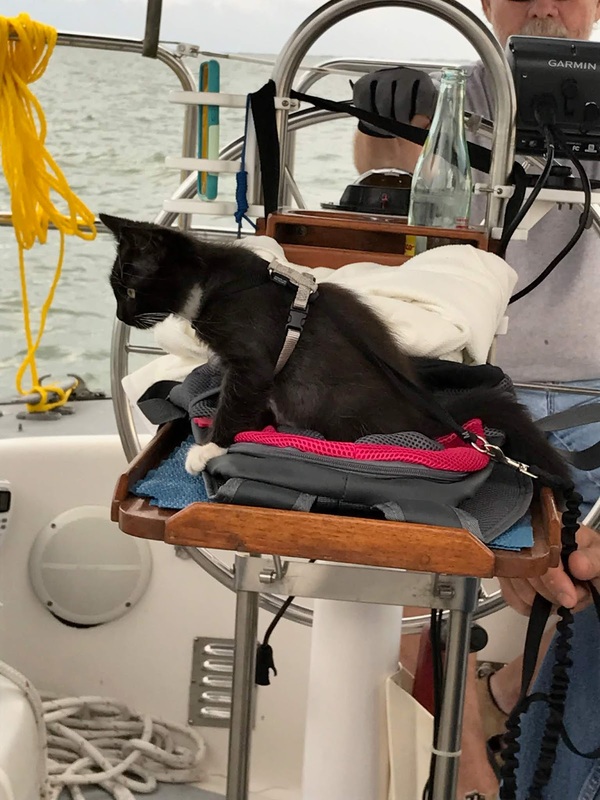 In the past, before we shifted from boat life to home life in Rockport, once I closed the gate behind me on the dock and sat him down with his leash and harness on him, he would head down the dock, maybe stopping once or twice at the wrong boat, before finding our boat and enthusiastically jumping on board. 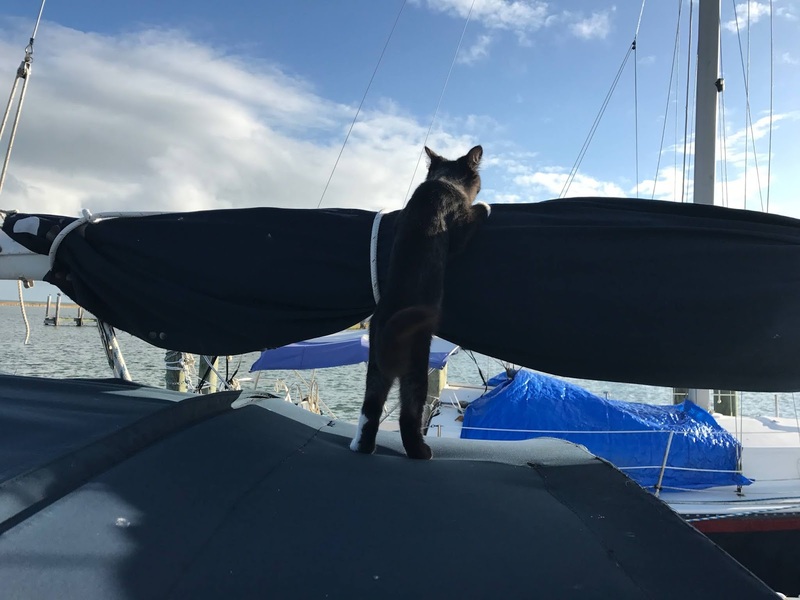 He then would spend his time on the boat exploring everything about the boat, jumping on top of the bimini, sitting in a frozen position as he watched the water and the huge birds flying nearby, or napping in his little spot right outside the companionway. Skipper in his earlier days on his favorite perch. 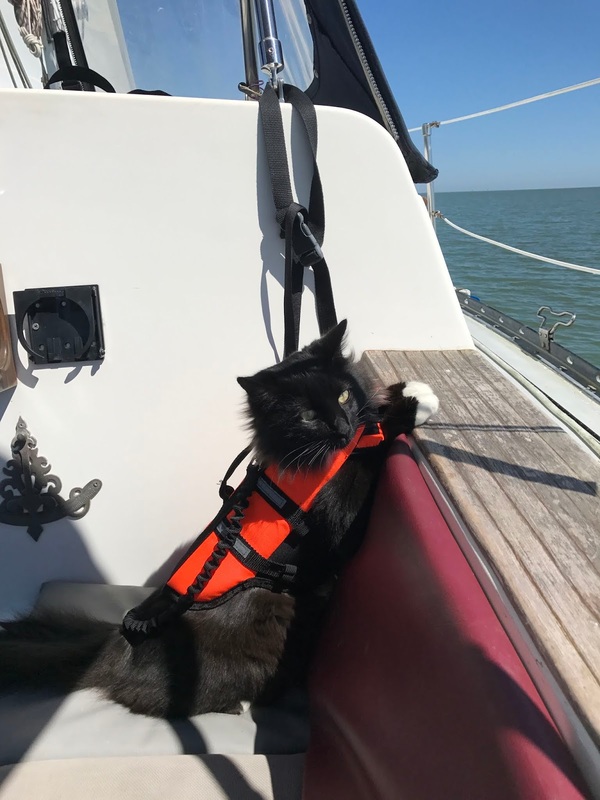 And when he was ready for sailing. Whatever the reason, the last two times we had tried taking Skipper to the boat, he had been extremely reluctant. Actually downright resistant would be a better word to describe his less than enthusiastic response to being on the boat. He apparently not only had forgotten where the boat was those last two times, but he seemed frantic to board every single other boat along the dock. Since we are near the end of the long dock, and that dock probably has 12 boats on either side of it, with finger piers running alongside each boat, that meant a lot of pulling him back before finally giving up and picking him up. 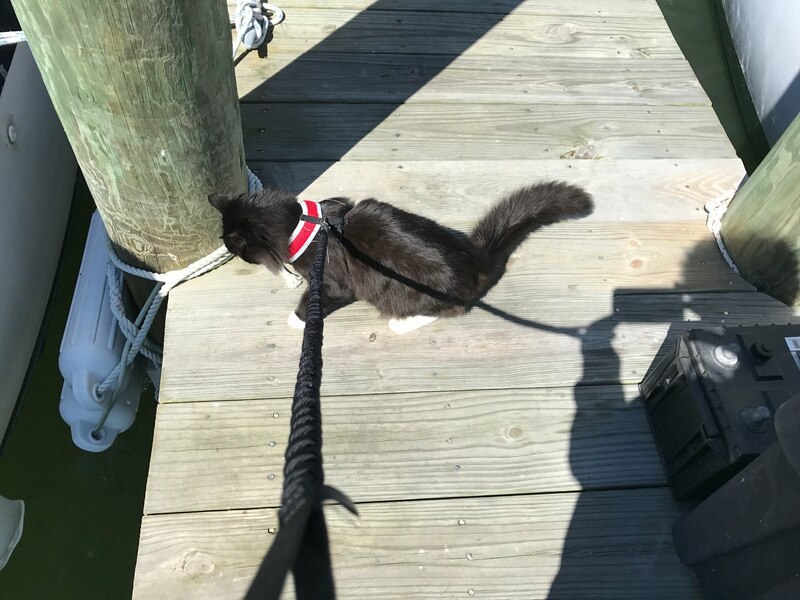 The rest of the trip down the dock was spent carrying him with his claws digging into my shoulder and him meowing a very pitiful meowing sound. My fantasy was that he was trying to tell whoever could understand cat language, that he was being kidnapped - that's how pitiful it sounded. And then once we finally boarded, he fled into the cabin and stayed curled up in a ball the entire time we were on the boat. Seriously, if a cat could look sullen, that was the look he adopted on those last two attempts. 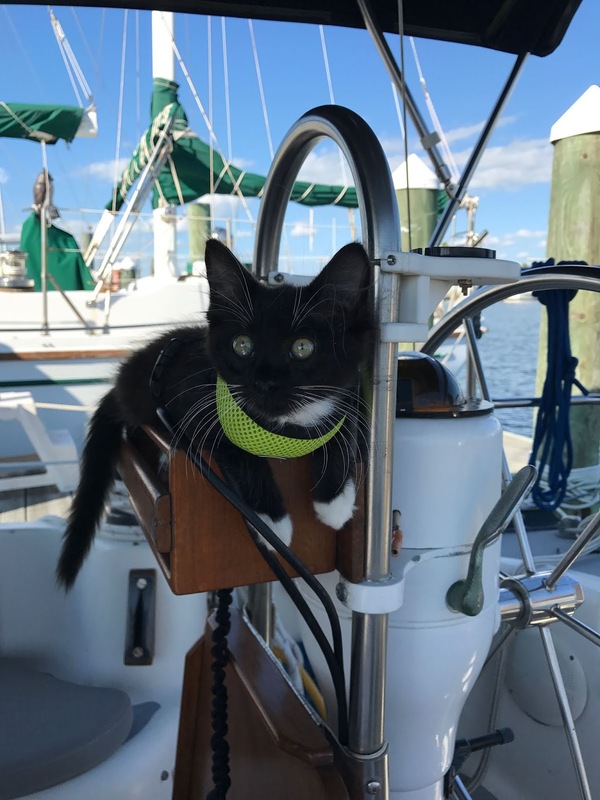 More early pictures of a chillin boat cat. He still finds the moving water captivating. This time, however, apparently the light switch went on that reminded him this was somewhere he liked being. This was, after all, his first home after we rescued him in Cuero on our way to the boat. Remembering the last two times we tried bringing him, which was what caused me to pronounce him no longer a boat cat, I was pretty nervous as we prepared to walk down the dock. It was after dark when we finally headed to the boat. I was fully prepared to have to carry him again, with his claws digging into my shoulder and him meowing the entire way. But I had his harness and leash on him, and so sat him down once I had shut the gate behind us. I expected that he would again lie down and refuse to budge or else frantically try and board the first boat he came to. Well, that's not what happened. 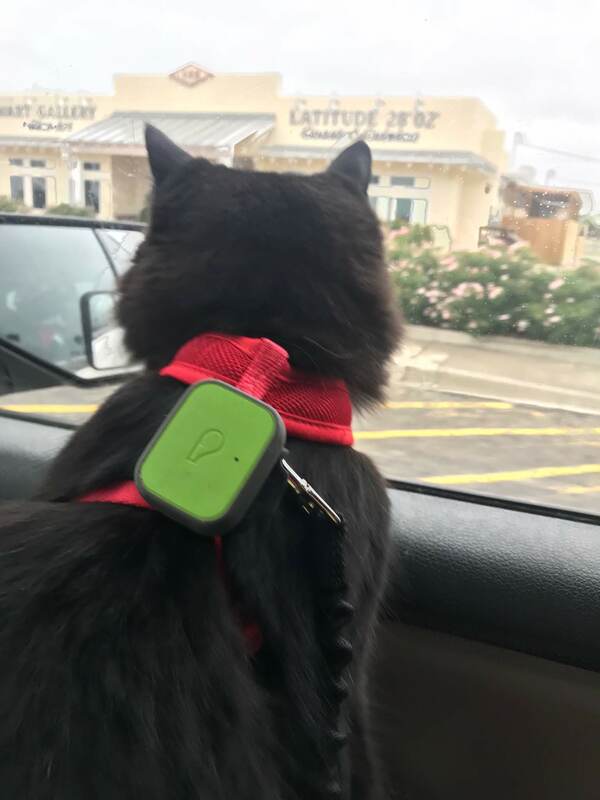 A little overkill Mom - a harness and tracker! As soon as I put him on the dock, he bolted as though I had just placed him on the starting line and we were off to the races. Seriously, we almost knocked over the gentleman in front of us who was carrying his groceries back to his boat, Skipper was in such a hurry to get down the dock. He didn't once stop at any of the other finger piers to try and board any of the other boats. He knew exactly where he was going and didn't stop until we reached our boat and he jumped on board - with me breathlessly running to keep up with him. That was definitely the quickest trip I have ever taken down that dock. Once on board, Skipper acted as though we had never left. And this part is the strangest phenomenon about this cat. When we are in Austin, he resists being held, ignores us most of the time, will put up with us petting him, but largely acts as though we are a nuisance. As soon as my husband and I were on the boat with him, he was rolling around onto his back, wanting us to rub his belly, under his chin, just anything to keep us in contact with him. He would follow us around on the boat in order to get our attention and to get us to pet him. And when it was time for bed, he curled up right next to me, instead of at my feet like he will do when we are in Austin. So his split personality is still there - he becomes very loving when we are in Rockport, whether it is on the boat or in the house in Rockport. Usually, regardless of whether we are in Rockport or Austin, he will beg to be let out as soon as daylight comes, but he didn't even do that this time. Of course, it was freezing and windy outside - he's not a dumb cat after all, and our heater was keeping us nice and toasty inside the boat. While we still had a few mishaps the rest of the time we were on the boat, and sometimes he still had to be carried part of the way to or from the boat, once we were on board, he acted the way he used to act on the boat. 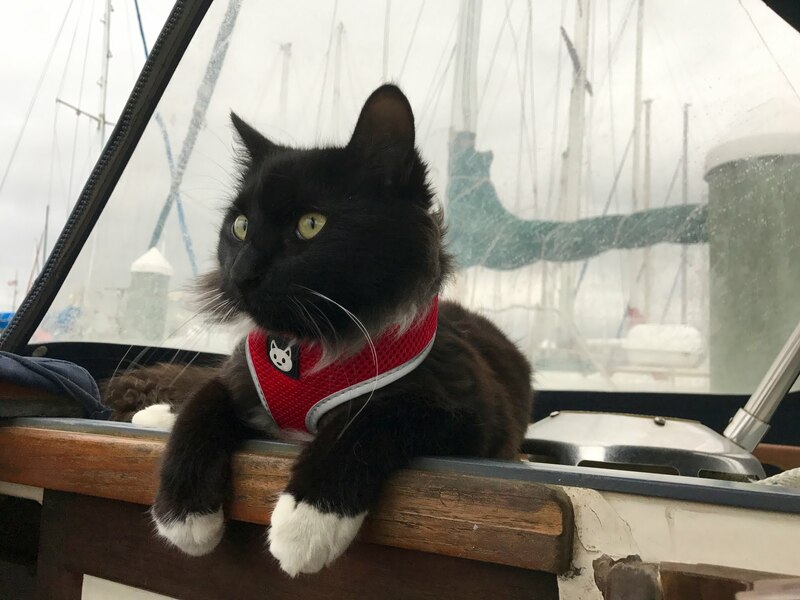 He seemed very content to once again be Skipper the Boat Cat.